I ended up having a pretty good sleep. There was also the bonus of not having canine visitors in the middle of the night. The weather was pretty much the same as when I went to bed. Grey skies and no wind to speak of. There was a feeling of rain in the air though. I must mention now for all you prospective bivy bag owners. Keep it unzipped a fair bit, otherwise you may drown from condensation, as that’s what I was faced when I woke up. 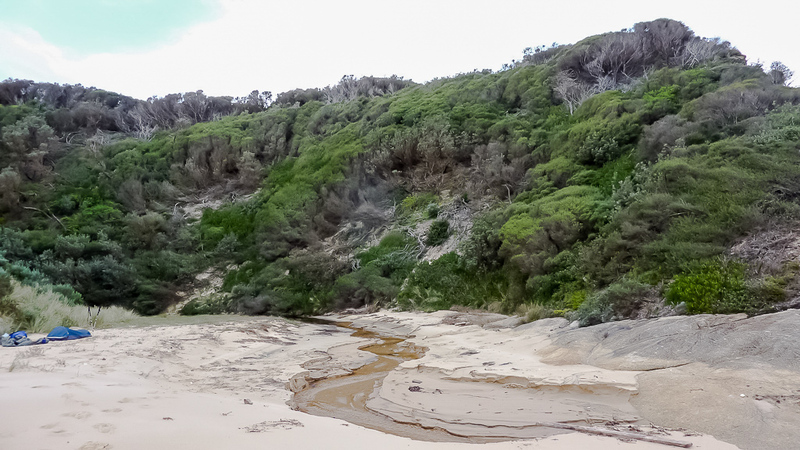 I got ready for another fun-filled day, with 12 km of beach walking from Sydenham Inlet to my next camp at Clinton Rocks, Croajingolong National Park. Yet again, I was feeling a little apprehensive as there was another inlet to negotiate a few hours further along the beach. Tamboon Inlet. During my planning conversations with Parks Victoria, I was assured this inlet would be shut. In the back of my mind though, there was the feeling this might have changed. I hoped not, as I didn’t want to spend another day trying to bum a lift off some random fisherman. Oh well, after breakfast and a cup of tea I was packing up and ready to go in under 15 minutes. 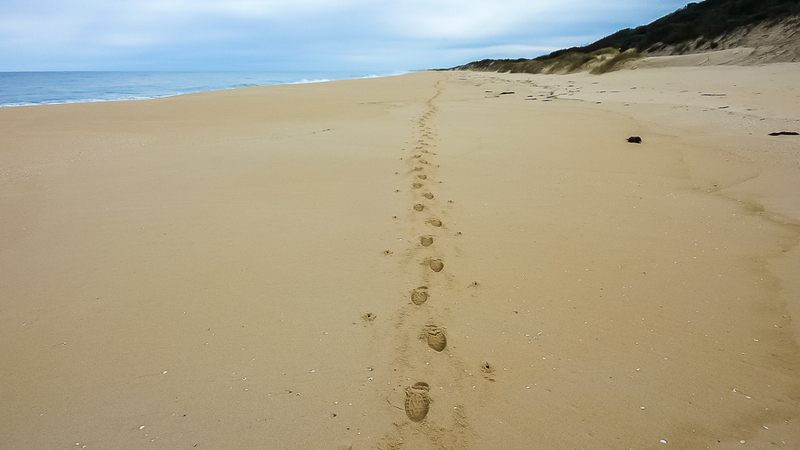 I really didn’t have much to pack and before I knew it I was trudging on the now traditionally soft sand. I hadn’t been walking long, before I stumbled across some interesting looking footprints. Clearly animal, but I’m not sure which type? They were further on from the dogs I’d seen the previous evening. 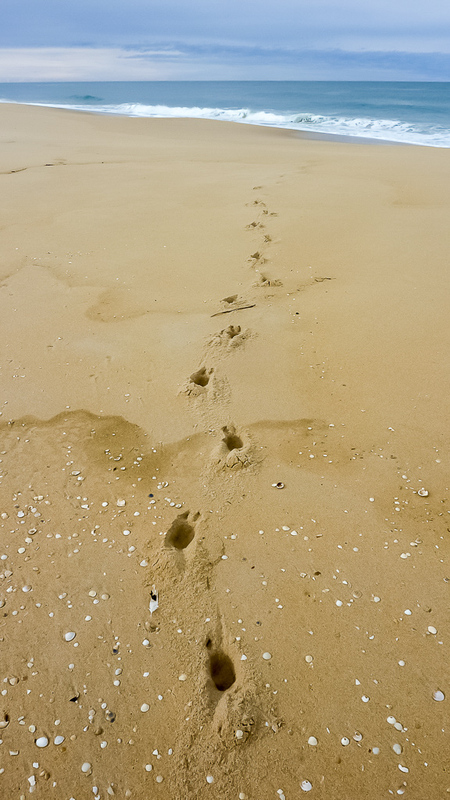 Every morning, there were animal tracks to be seen on the sand, but for the entire trip, these were the most unusual. Quite an intriguing gait. As it was, I put it down to some sort of animal, but it made me wonder what was going on in the middle of the night whilst I was sleeping. The pigeon toed look left me a little baffled. Were they from a Yowie? Bunyip? Alien? Jimmy Hoffa? Let’s have a closer look. 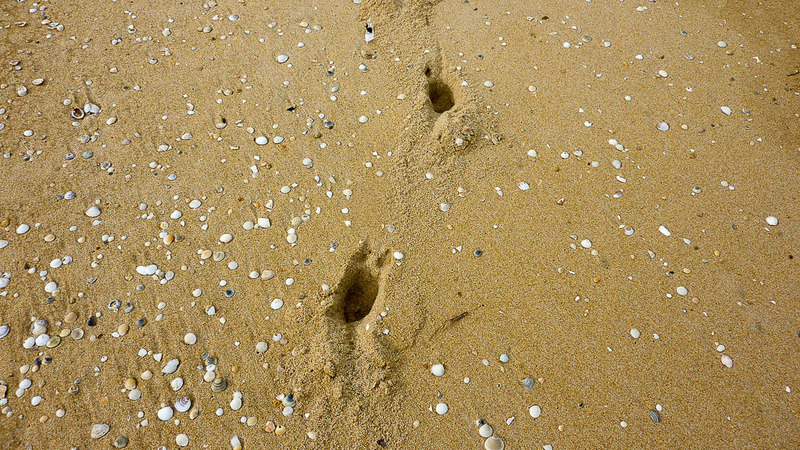 Besides unusual looking footprints, there’s another thing object I saw repeatedly. Every single day. Yep, you guessed it. Light bulbs. Huh? That’s right, there were dozens of them washed up on the beach and I assume a container load went overboard from a ship at some time. You don’t believe me? 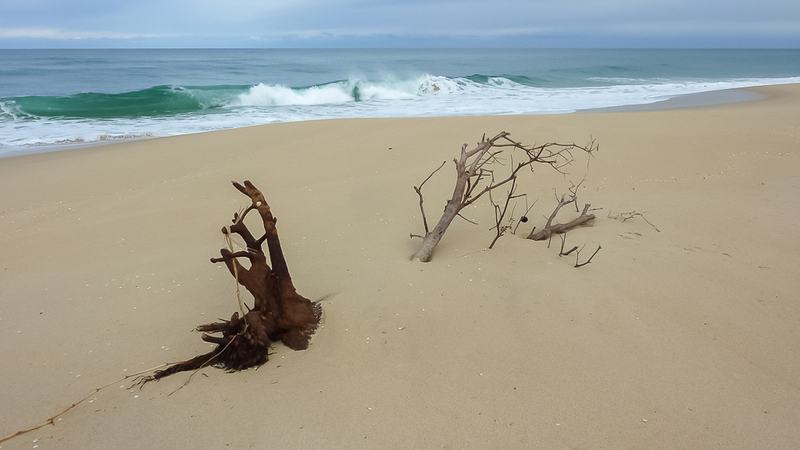 There’s one thing I read about when walking the Wilderness Coast at Croajingolong. The wind. 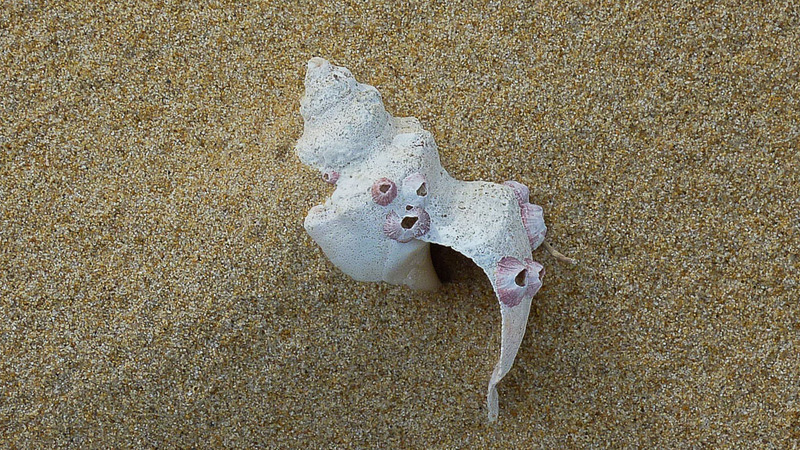 Apparently it gets pretty fierce at times and I was reminded of this when I came across tree stumps, half buried in wind-blown sand. Really, I shouldn’t think about things too much, as on cue the wind started to pick up. As in really pick up. 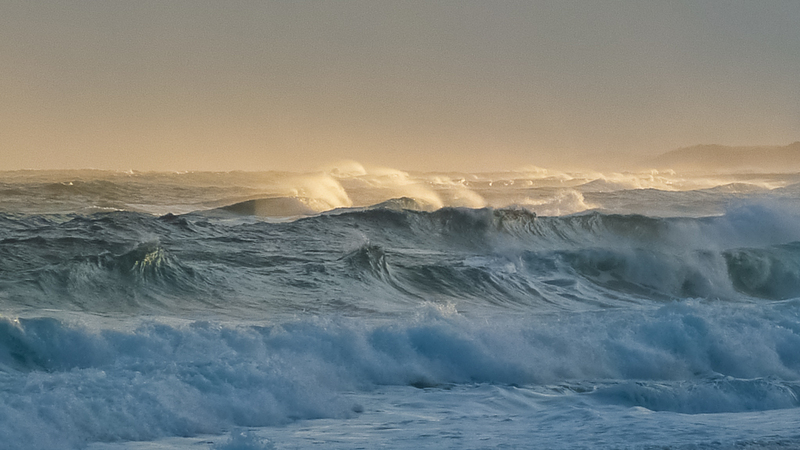 It was amazing how quickly the weather began to change, as a storm front began rolling in from the ocean. Thankfully for me, the wind was behind me, as it would’ve been horrific coming from the opposite direction. Strong gusts would blow enormous sheets of sand into the air and they’d swirl around and over me, but not in my face which was the main thing. There was no rain at this stage, but it was definitely coming. 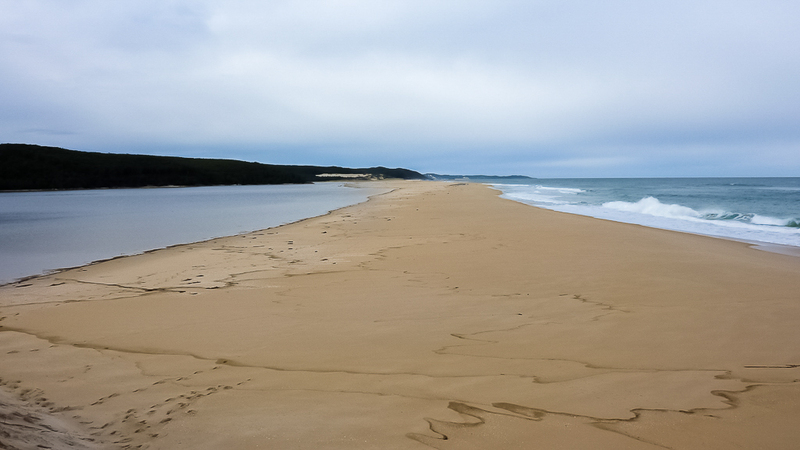 It was hard to pick up the pace on soft sand, but I tried to reach Tamboon Inlet, as fast as I could. Just so I could put any wonder about it being open out of my mind. I also wanted to reach Clinton Rocks Creek, which was going to be my destination for the night. Hopefully before any incoming rain. During my slog, I was feeling glad it wasn’t high tide, as right to the top of the beach, I noticed the high water mark. Now that would have made for some really crap hiking, as behind this water mark were a string of tall sand dunes and shrubs, which would have made a time consuming struggle. Undulating softer sand would have been much worse, than my casual soft sand I was already walking on for the day. Oh, a lower tide didn’t seem to mean the going was any easier either. I wandered near the waters edge on occasion and it was as soft as anywhere else, so I stuck to a central approach, as at least it was level. Finally as I approached Tamboon Inlet the wind picked up even more and rain started to fall. I wasn’t cold due to the exertion of walking, but this changed instantly when the rain hit. Accompanied by the wind, it was freezing, so I immediately stopped to don my overpants and rain jacket straight away. Tamboon Inlet was a thankful sight, as it was closed. It’d been on my mind all morning, but instead of a potential wet crossing, a firm sandbar greeted me, so I scooted across it quickly. Another potential hurdle successfully negotiated. Actually, as I walked across it, I noted the flat, sand bar separating the lagoon from the sea was less than 100 metres wide. 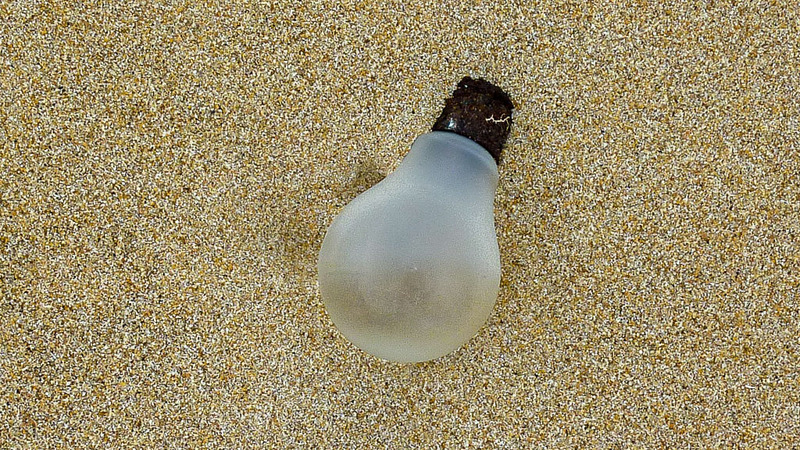 It didn’t seem much would be needed to open it either, as the sand is barely above sea level. 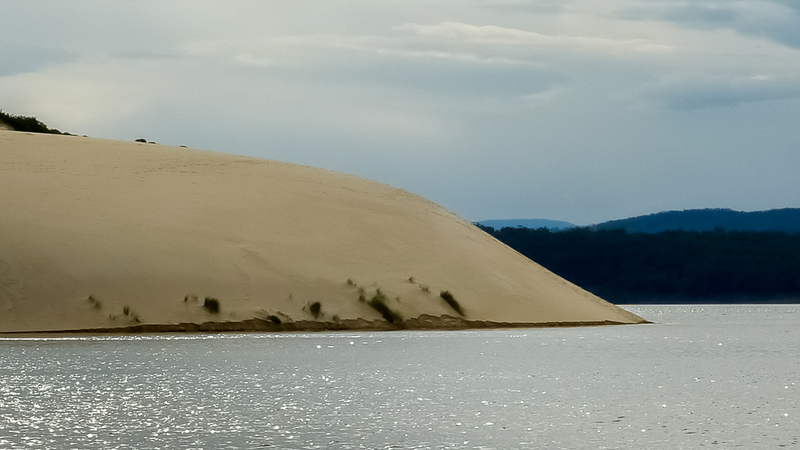 During my sea level wander across the inlet, some enormous sand dunes caught my eye. These things were massive and I can’t say I’ve seen bigger on any Australian beach I’ve ever been to. Once clearing the inlet I only had a short distance to Clinton Rocks Creek. With no local knowledge, it seemed logical to stick to the suggested camp sites from the book, ‘Walking the Wilderness Coast’. I must say though, in the book, Clinton Rocks Creek looks quite flash, but that wasn’t the case in real life! I was hoping to get some fresh water, but there was barely a trickle. Instead, there was plenty of salt water, as waves pushed up into the creek. A lot of rubbish had also been washed in, plus the spot to set up in seemed a little exposed. One other thing perturbing me was the sand bank to set up on was not a long way from the high tide mark. I looked around a bit, but couldn’t really find anything much better, so I elected to follow the books suggestion. Luckily for me, as I started to set up the rain stopped. 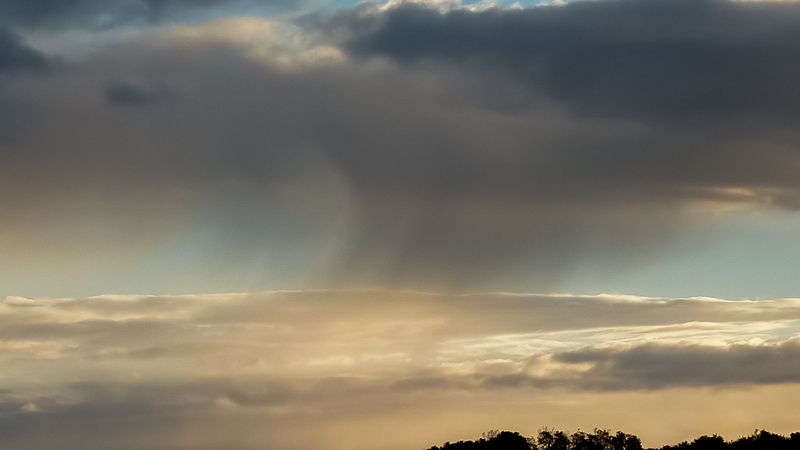 This allowed some weak winter sunshine to put some colour in the sky. The wind continued, but overall it wasn’t too bad, although I noted a line in the book. Regarding the Clinton Rocks campsite. ‘…It’s exposed to south-west winds…’ Intrigued, I looked around where the wind was coming from and confirmed it was coming from the south-west. Okay, with this observation, the evening could only get interesting. There are some nice rocks in the area, which glowed, as the setting sun shone on them. Perfect for an old favourite. 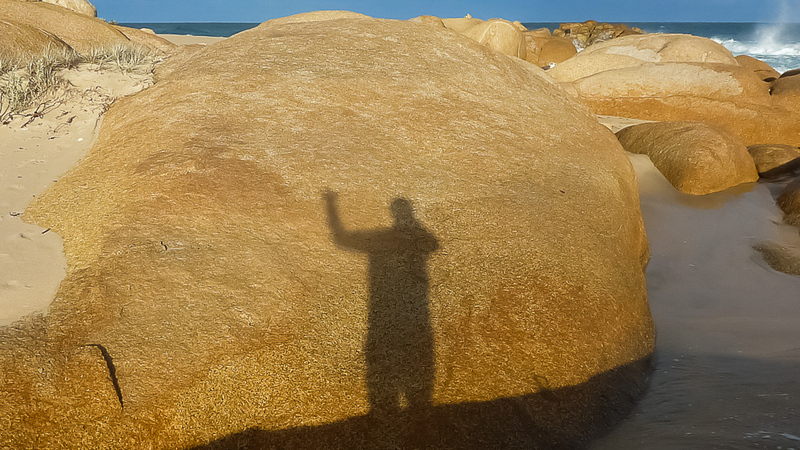 The ‘waving-selfie-shadow’ photo. Shining on breaking waves, the setting sun certainly looked fantastic. 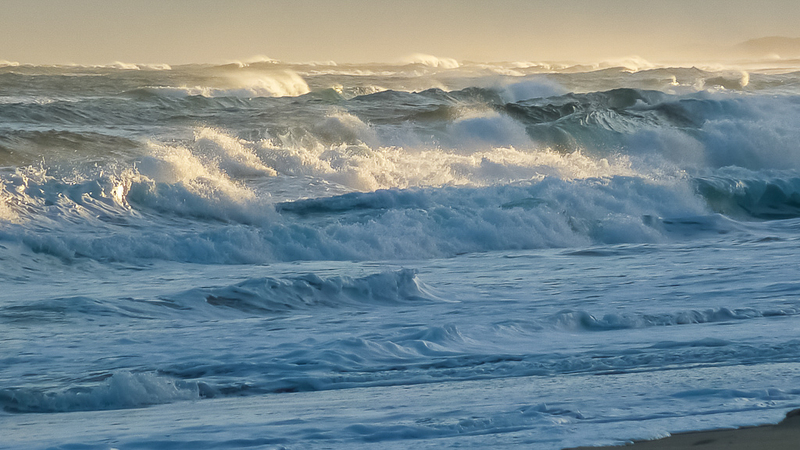 I spent quite some time, sitting on the beach and watching the waves roll in. The breaking waves were quite deafening and with a freezing wind coming off the ocean, I decided to eat and then get an early nights sleep. 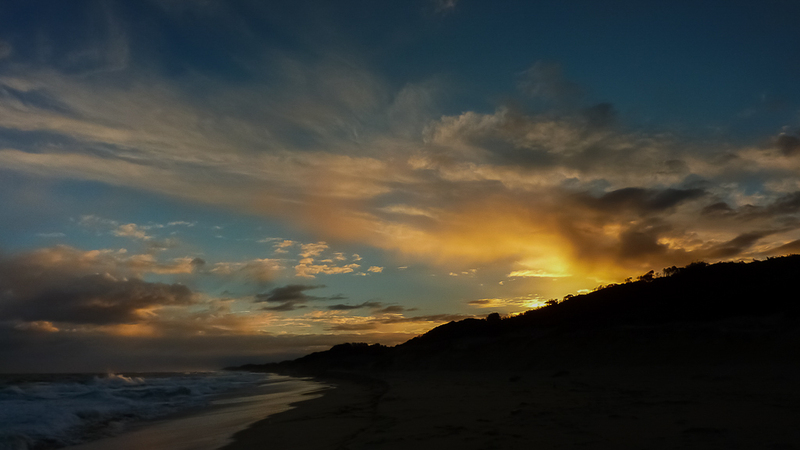 There were more storms in the air, as I found a small spot behind a sand dune and ate dinner out of the wind. One thing about winter hiking is light fades quickly. I elected to go to bed as soon as it got dark, which just happened to be 6.00 pm. Thanks. 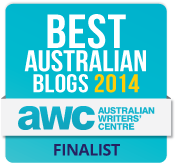 Yeah, that’s what I’ve just found out, as my latest post is about it. Glad I got the answer, as it flummoxed me for a while.